Download Google Web History to see a history of all your searches. Want to Know What You Were Googling This Time Last Year? There’s a Way to Check. 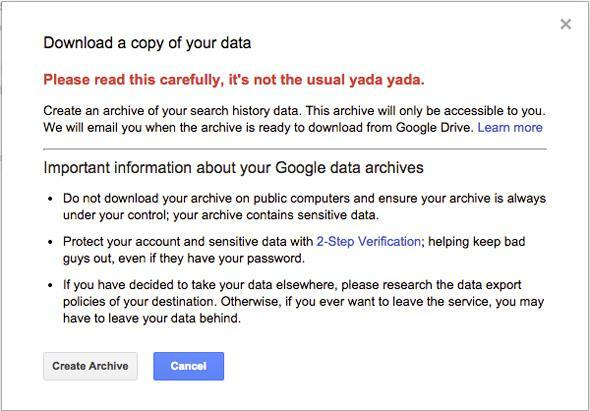 A record of all your Googles ever yada yada. I’d rather forget most of the things I Google. It’s a lot of words I don’t know how to spell that I want Google to autocorrect for me. And there’s stuff like “how many feet in a mile?” Not my proudest moments. But it’s so easy to do these searches that they feel ephemeral. They’re like an extension of your own mind. But beware, because they’re really not. So just a quick reminder: Google is tracking all of your searches and storing them. Forever. And you can access that whole log if you want to. The history only includes searches you’ve done while logged in to Google, but if you keep Gmail open on your computer, that’s probably most of the time. The data downloads as a JSON file, which isn’t really meant for human consumption. But even if you have no idea how to manipulate the file, you can still open it in a plain text reader like TextEdit or Notepad and search for “query_text” to get to the part of the data that shows what you’ve searched on Google. It’s kind of daunting to think that you can revisit every dumb or deeply personal thing you’ve ever searched, but it’s important to know that the feature exists—because Google certainly does. This is the foundation of how the company’s algorithms decide what search results to show you and how to target ads to you. Google forever knows what a terrible speller I am.